Vision R&D concentrates all of the clinical and pre-clinical knowledge generated by the IOBA. Also, Vision R&D has access to the latest technologies in chemical analysis and other disciplines available in the different laboratories and departments of the University of Valladolid. As a result of this vast experience, we are able to offer a line of pre-clinical services to evaluate the biocompatibility of ophthalmic medical devices in vitro and/or in vivo. Our studies are carried out under quality standards (GLP) and maintain absolute confidentiality at all times. In this way, we offer a unique service in our country, supported by scientific publications and extensive experience in collaboration with companies. Evaluation of security (biocompatibility) and/or the tolerance of medical devices using in vitro/in vivo experimental models or in vitro/in vivo eye pathology models, for products that are under development or currently on the market. Evaluation of efficacy of medical devices. Replication or development of experimental models resembling ocular pathologies to meet the needs of our customers. This is the compatibility of any material with living tissue or a living system, by not being toxic, injurious, or physiologically reactive and not causing immunological rejection. WHY SHOULD MEDICAL DEVICES BE EVALUATED? Evaluation of medical devices is crucial to determine their possible clinical applications and to properly establish their biocompatibility grade, in accordance with their mechanical, physical and chemical properties. The application of appropriate methods and evaluation parameters involves a great global concern that has been investigated using specific guidelines (International Organisation for Standardisation (ISO) 10993 Biological evaluation of medical devices). These guidelines are conducted to protocolise various biocompatibility tests including, among others, cytotoxicity, sensitisation, intradermal irritation and acute systemic toxicity tests. Class I: most non-invasive devices that do not interact with the body or that come into contact with intact skin only. All invasive devices with respect to body orifices, other than surgically invasive devices and which are not intended for connection to an active medical device, if they are intended for transient use. Devices intended for short-term use only if they are used in the oral cavity as far as the pharynx, in the ear canal up to the ear drum or in the nasal cavity. Also, reusable surgical instruments. Class IIa: invasive devices that are intended for short-term use or long-term use only if they are used in the oral cavity as far as the pharynx, in the ear canal up to the ear drum or in the nasal cavity, and are not liable to be absorbed by the mucous membrane. Surgically invasive devices for transient or short-term use with exceptions. Also, those that exchange energy with a patient in a therapeutic manner or are used to diagnose or monitor medical conditions. All active devices intend to administer and/or remove medicines, body liquids or other substances to or from the body if it is not hazardous for the patient. Class III: all surgically or implantable devices intended to make contact with the central circulatory system and/or the central nervous system. Devices intended to have a biological effect or to be wholly mainly absorbed, those substance considered a medicinal product incorporated as an integral part and devices manufactured utilising animal tissues or devices rendered non-viable except such devices which are in contact with intact skin only. Class I devices correspond with the low risk while Class III with the higher risk. The biocompatibility evaluation is applied to all medical devices that are in contact with the patient in a direct or indirect way. A structured protocol of biological evaluation must be accomplished and documented by a qualified technician for each medical device and evaluation of the existing literature should be considered. All potential risks have to be considered, but it is not necessary or practical to perform all tests for these risks. Chemistry composition of the medical device and its parts. Specific tests have to be selected for each medical device. These tests must be developed by using all of the available information about the device, literature data (valid scientific and medical publications) and pre-clinical and previous clinical data assays. It has to be determined whether the assays should be performed in the finished product or in representative samples of the finished product. It must be taken into account that it is necessary to carry out re-evaluations if there is any change in the products, their use or if there is a risk of adverse effects. Relevant tests corresponding to each product class must be considered. Relevant tests for the product class must be considered to individually evaluate each medical device. 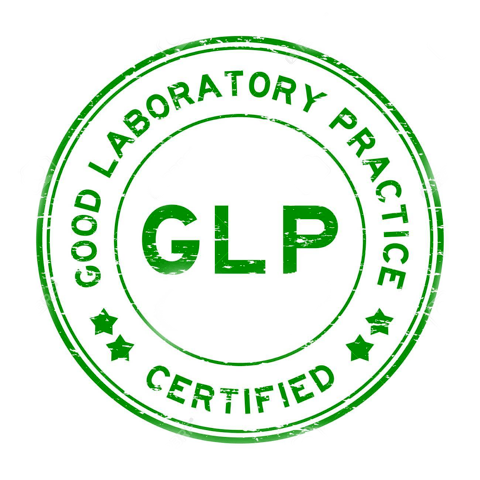 Thus, the test to be developed must be based on the final application of the product; it must be sensitive, precise and exact, and be performed under Good Laboratory Practices (GLP) or with GLP accreditation. WHICH OPHTHALMIC MEDICAL DEVICES SHOULD BE EVALUATED? 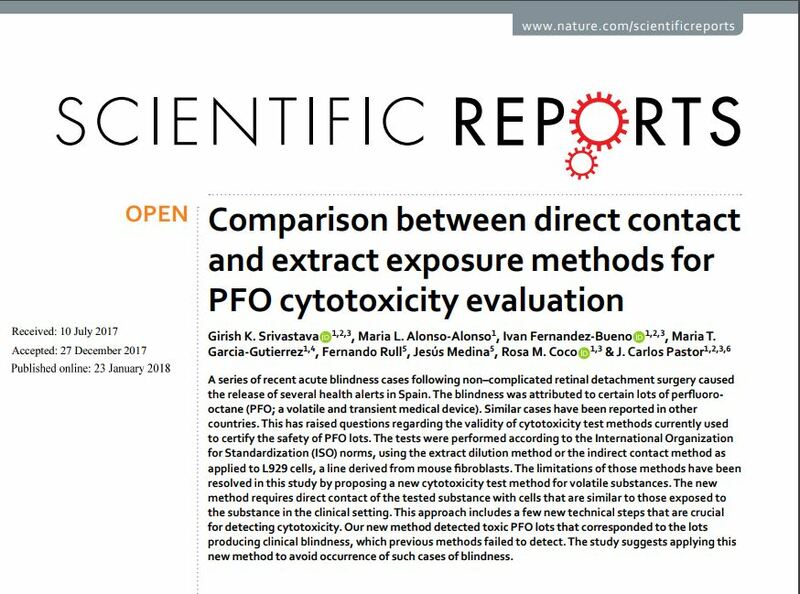 Since 2013, several PFOs from different companies have produced cases of ocular acute toxicity in patients from several countries, which led to a good number of cases of blindness. In 2015, on behalf of the Spanish Agency of Medicines and Medical Devices, the IOBA began to investigate the causes. As a result of these investigations, several toxic products have been identified that have been withdrawn from the market. Above all, it has been detected that some of the tests (indirect or indirect extraction) used by different companies to evaluate cytotoxicity, despite complying with ISO standards, were able to detect the toxic lots. The IOBA has developed an original, direct method for the evaluation of cytotoxicity, which has been proven in dozens of analyses and is capable of detecting toxic lots. This method has been patented and published in a scientific journal with a high impact index. This is the method that Vision R&D uses. Perfluorocarbon liquids (PFCLs) have been proposed since the 1990s as useful adjuncts during vitreoretinal surgery, mainly for “flattening” the retina but also with some other purposes. Several of these liquids have been used in ophthalmology, with perfluoro-octane and perfluorodecalin being the most widely used. PFCLs are classified as Class IIb products following the rules listed in Directive 93/42/EEC Annex IX because they are considered a medium risk surgically invasive medical device. Since the beginning of the use of these substances as tools in intraocular surgery, it has been shown that some can be toxic for intraocular tissues depending on the conditions of use. However, the large series of problems that has occurred since 2013 with several PFCLs from various manufacturers worldwide, have caused a real shock among retinologists. After several months of research, the Retina group of the IOBA detected that the cytotoxicity tests, used by several Testing Companies to evaluate the safety of these compounds, despite complying with ISO standards, were completely inadequate. The IOBA has therefore developed its own test, which has been patented and validated after the analysis of numerous lots of PFO, both toxic and safe. This method has been published in Scientific Reports. Medical devices are placed on the European market after conforming to strict safety assessments to comply with EU Medical Devices Directive 93/42/EEC. Safety assessments of medical devices are guided by toxicological and other studies recommended in the ISO 10993-1/EN 30993-1 standard. There are 17 parts of the standard which are either accepted or under preparation. Tests that may be used in the evaluation of medical device biocompatibility include procedures for CYTOTOXICITY, skin sensitisation, dermal irritation and intracutaneous reactivity, acute systemic toxicity, subchronic toxicity, mutagenicity, implantation, haemocompatibility, chronic toxicity and carcinogenicity. The cytotoxic elements of a medical device can leach into an extraction medium. The extracted medium is exposed to the test culture by applying direct or indirect test methods. This is applied by exposing a medical device or its extract directly to test cultures. This is applied by exposing a medical device or its extract indirectly to test cultures. The ISO 10993 Part 5 in vitro cytotoxicity test guideline provides several test methods for the cytotoxic evaluation of medical devices which could also be applied for PFCL test samples. However, scientific advances lead to improvements in test methods which increase the certainty of cytototoxicity test results. The NEW CYTOTOXICITY TEST METHOD is based on the direct contact method by applying new patented technical steps (patent Nº P201630708, PCT2080.12). Studies1, 2, 3 have shown that the new method is able to differentiate between non-cytotoxic and cytotoxic PFCLs. – Part 12: Preparation of samples and reference materials. – Part 5: In vitro cytotoxicity test. – Part 5 section C.2.3.3: Verification of the quality of analysis. Cost and discuss with research team. Special offers will be provided depending on the numbers of test samples.